So far the first six weeks into 2019 has been a pretty impressive go when it comes to the metals and a lot of the mining stocks in general. While gold is up over $1,300 US and holding around $1,310, palladium has surpassed the price of gold by a long shot with asks in the $1,410 US range. I was reading somewhere that some experts are calling for $2,000 US palladium this year. Quite a bit of news about mining stocks this year so far too. In the middle of January, Goldcorp and Newmont merged to become one of the world largest gold mining companies. In November last year Randgold was taken over by Barrick for it's high quality African properties. Some say that this sort of mergers and buy outs will be the norm over the next while as all the easy deposits are pretty much found and the fastest way to increase your reserves is just buy someone out. When it comes to the trading activity of some of the junior stocks, one stock this past few weeks stands out as spectacular. 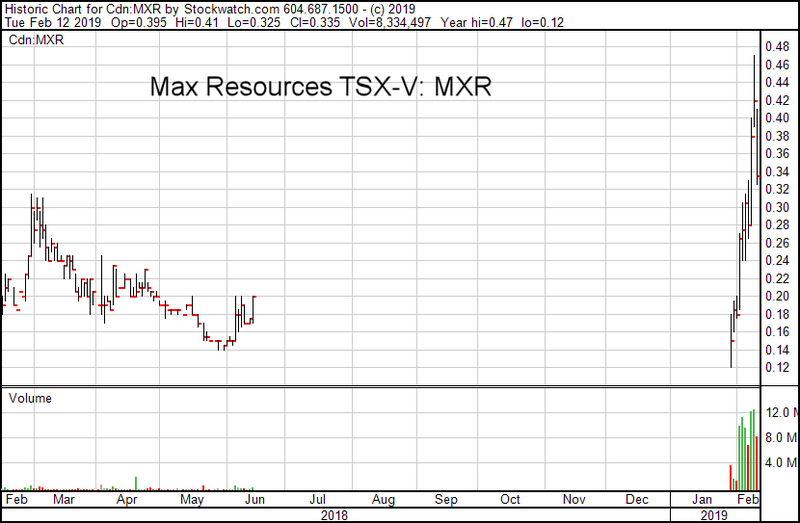 Max Resources TSX-V: MXR has seen it's stock price more than double in the past week or two. The company has a gold project in Columbia South America. Max Resources has 100-per-cent ownership of 82 and 50 per cent of seven mineral licence applications, totalling over 1,757 square kilometres, located within Choco department, approximately 100 kilometres southwest of the city of Medellin, Colombia. Compania Minera del Choco Pacifico produced 1.5 million ounces of surface gold and 1.0 million ounces of surface platinum from the Choco district between 1906 to 1990, largely limited to an average depth of eight metres or less. This Max Resources play has the makings of a major play this year much like Novo Resources TSX-V: NVO which is exploring in Australia did last year. After the news of the Barrick - Randgold buyout, articles started to appear how companies like Tanzanian Royalty TSX: TNX were undervalued. These articles helped push the stock price of Tanzanian Royalty up over 100%. Great Bear Resources TSX-V: GBR is another junior seeing highs in it's stock price. Above average drill results have taken this play from 50 cents this last summer to $3.50 in a few short months. Of course news such as 1,602.73 grams per tonne gold over 0.70 meter at 150-meter vertical depth can sure help propel a stock to new highs. These results of course helps the stock price of neighboring juniors such as Argo Gold CSE: ARQ see their stock get some love from investors also. 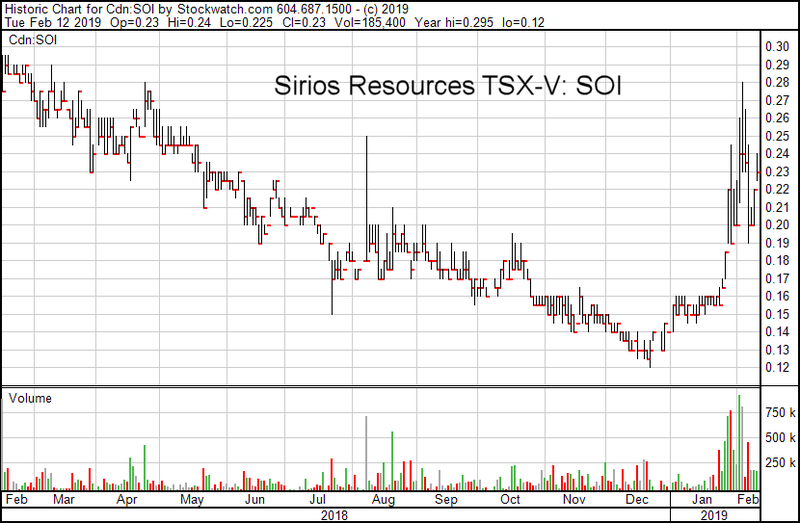 Sirios Resources TSX-V: SOI started a winter drill program last month on their Cheechoo gold property, adjacent to Goldcorp's Eleonore gold mine at Eeyou Istchee James Bay, Quebec. Sirios plans to drill more than 40 drill holes for a minimum of 10,000 metres. Also Triumph Gold TSX-V: TIG released news of 3.79 m of 6.72 g/t Au at their Freegold in the Yukon. Of course all the information above is just a blip in the big picture of things but it goes to show that 2019 has some huge potential for some juniors and their investors.